We must admire a crime writer who can bring his readers to tears -- of laughter! Author Simon Read now has three books to his credit, and two of them are in our favorite genre. Read's first book was On the House: The Bizarre Killing of Michael Malloy, published by Penguin in 2005. Readers and reviewers alike fell in love with his "darkly comedic and violently gritty" narrative. Read's second book was The Killing Skies: RAF Bomber Command At War. But before we could lose him to the military history set, he's penned another for us. 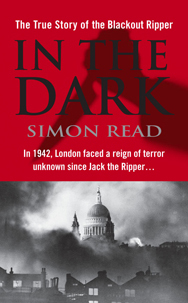 His most recent book is the first that's ever explored in depth the story of London's "Blackout Ripper" of 1942. The serial killer murdered four women before Scotland Yard got its man. Read was able to find not only the trial transcript, but the police file as well -- both in the British National Archives. The result is called In the Dark: The True Story of the Blackout Ripper. I had a chance to ask this author a few questions, and he kindly replied. Here's our Q&A. So many people are furiously interested in serial killers. How did you find a hitherto unknown Ripper, and can you whet our appetite for your story of London's Blackout Ripper? I stumbled across the Blackout Ripper while reading a book about crime in 1940s London. One chapter made brief mention of "The Blackout Ripper," a serial killer who slaughtered four prostitutes in London's West End over the course of one week in February 1942. The similarities between these crimes and the 1888 rampage of Jack the Ripper struck a chord, and I realized I'd stumbled across the subject matter for another book. The story, I think, has all the makings of a great thriller. You have a suave and charismatic serial killer, a team of relentless detectives and a brilliant setting. Researching life in wartime London was incredible fun. Plus, the image of a killer stalking the streets of a blacked-out city really appealed to the storyteller in me. Are you satisfied that justice was served in the case? Personally, I'm very satisfied with the way justice in the case prevailed. Scotland Yard led the way in fringerprint analysis. Its detectives actually trained other agencies, including police departments in the United States, in the art of fingerprinting. The evicence against the Ripper -- a man named Gordon Cummins -- was very strong. Not only did police lift his prints from several of the crime scenes, they found in his possession property belonging to some of the victims. You're a clever writer and include sly humor in your prose. Do you find your writing influenced by the old newspapers you've read? When I write, the story's subject matter dictates the writing style. When I wrote ON THE HOUSE, I relied heavily on articles from the New York tabloids of the 1930s. The writing in the papers back then was fabulous, dripping with a lot of humor and style. That certainly influeced my writing of the book. When I wrote it, I kept in mind the way people speak when you watch a movie from the 1930s -- "Say, Johnny, whatsa the big idea?!" -- sort of clipped and fast. At the same time, I wanted the book to have a noirish feel. I love Raymond Chandler and wanted the book to have that kind of feel to it. Who are your favorite true crime authors? The best book(s) you ever read in the genre? I don't necessarily have favorite true-crime authors, but I definitely have a list of true-crime books that I really enjoy. My favorite, however, is Truman Capote's IN COLD BLOOD. I suppose this is a rather cliched answer, but it remains an incredible piece of writing. Likewise, John Berendt's MIDNIGHT IN THE GARDEN OF GOOD AND EVIL is a book I love. Both books go way beyond reporting the gory details of a specific crime . . . they flush out the time, place and various individuals involved to produce a timeless classic. Another great example would be Norman Mailer's THE EXECUTIONER'S SONG. I understand you're a Steinbeck junkie. Did he ever write a murder story? He actually wrote a story called THE MURDER, but it's not a true crime . . . though I believe it may have actually been inspired by real events. Many authors spend years, even decades, trying to find someone interested in an historic crime story. Who's your agent, publisher? Was it a hard sell? My agent is Ed Knappman of New England Publishing Associates. He's been kind enough to have me as his client for five years or so now. His emphasis is non-fiction books. He took me on originally to represent my book THE KILLING SKIES, a history of the British bomber offensive against Nazi Germany during WWII. That book sold to a British publisher. During the pitching process for TKS, I penned the proposal for ON THE HOUSE. I think we went through 14 publishers or so before the Berkley imprint of Penguin picked it up. They also purchased IN THE DARK. What is your next book going to be about? Your blog http://www.simon-read.blogspot.com/ gives a few clues. 1800s. San Francisco. Let me guess: Durrant? My next book is a bit of a departure . . . it details, in part, the murder of Charles de Young, co-founding publisher of the San Francisco Chronicle. He was blown away in the middle of the newsroom following a vile -- and darkly comedic -- war of words with the Rev. Isaac Kalloch, a mayoral candidate in 1880s San Francisco who actually did become mayor. The gunman was Kalloch's son. It's in the process of being pitched right now. My fingers are crossed! I was, at one point, considering a book on Durrant but decided to go with de Young! For more about Simon's work, including an excerpt from his Ripper book, visit his website, www.simon-read.com.